LANSDOWNE PLACE IS THE LATEST HIGH PROFILE PROPERTY DEVELOPMENT ENTICING INVESTORS. How far do you need to travel these days to find an investment with a decent return in a wobbly and unpredictable property market? The answer is closer than you think, but it might sound too good to be true. So far, Dublin has charmed global tech companies like Facebook, LinkedIn and Google into building their European headquarters in the city, and many of them have plans for further expansion. Dublin’s luck hasn’t run out yet, with Ireland’s economy growing by 7.3 per cent, three times faster than any other country within the EU in 2017. This growth has resulted in a population boom, providing a natural long-term source of demand for housing. 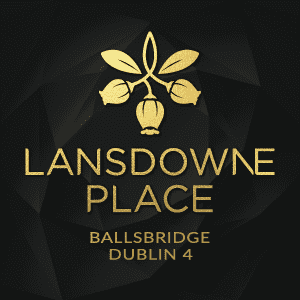 Rental inflation is also expected to grow 5 to 6 per cent in the next 12 months, offering the ideal opportunity to invest in, Lansdowne Place, a development located in the prominent district of Ballsbridge, Dublin 4. Set on the historic site of the former Trinity College Botanical Gardens, leading Irish developer Chartered Land has created a smart and contemporary collection of 215 apartments and 24 penthouses, designed by O’Mahony Pike with sophisticated interiors delivered by London-based Goddard Littlefair. One, two and three-bedroom apartments range from €800,000 to €2.3m and are due to complete in 2019. The apartments are bigger than your average new home in London, with kitchens featuring bespoke concealed larders with solid timber drawers, but the biggest draw to Lansdowne Place is the landscaping. A vast number of trees and plants are original specimens retained and preserved from the original Botanic Gardens that were present on the site for 150 years. One exceptionally rare specimen, a strawberry tree, is deemed to be of such national significance that it’s protected by the Tree Register of Ireland. Whether it’s a buy-to-let, second home or a pied a terre, the good news is that there is potential for strong income returns, meaning investors at Lansdowne Place would benefit from a rental premium of around 4 to 5 per cent, based on its prime location, which is comparable to the income you’d expect from a London property. “Now could not be a better time to invest in the Irish residential market. As the fastest growing economy in the EU and with comparatively low price points and stronger yields than London, Paris or Amsterdam the city is a fantastic option for those looking for a European base,” explains David Browne, new homes director at Savills Ireland. Many investors are buying properties that serve a dual purpose, he says, with high yielding investments for now and trade down homes for the future. They believe that the investment rationale remains particularly positive for cash-financed investors in Ireland. This article originally appeared in CITYA.M.